Working from home is a wonderful way to make a living, but there is always a slight danger that you will find yourself being distracted. One of the first things people working from home often get distracted by is food! When you find yourself snacking mindlessly and impulsively, it may be time to consider making a few changes to how you manage that urge. Especially during the warmer months, you might be dehydrated rather than hungry. This is particularly true if you also drink a lot of coffee, or caffeinated drinks. There are other benefits of drinking water as well, as WebMD states here. It’s easy to lose track of time when you’re deeply engrossed in a project. But hours can pass by without you getting up from your desk once— I make a point of going for a 30min walk daily when the weather is good, otherwise I love to blast some music and pretend I can dance – whatever works for you just move and take regular planned breaks to readjust. Breakfast really is the most important meal of the day! When I first went on maternity leave I found I stopped eating a proper breakfast compared to when I was going to work. And then I would spend the day snacking!! Health.com have a great video that gives you some ideas on how to maximise the impact of your breakfast here. Planning ahead ensures not only that I don’t have to think about food when I am starting to get hungry, but also means I can make sure that the meals are nutritious, delicious, and that there are leftovers for the next day! On days when I am really struggling to keep away from the snacks, getting out of the house, getting some fresh air, and enjoying some time with bubs is a great way to divert my thinking. On a nice day, going to the park or going for a walk feeds my soul, which is just as important as feeding my body! Working from home has so many benefits, but easy access to your kitchen can come at a cost to your health. Having a plan to combat those times when you want to reach for a snack is crucial, and regular exercise helps as well. 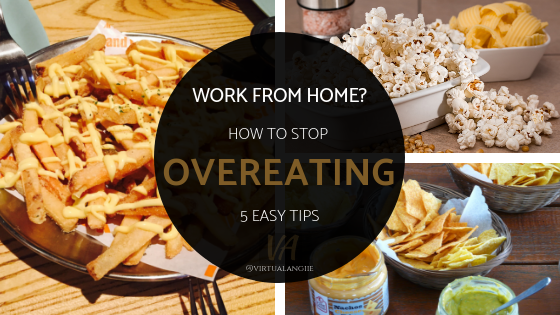 What do you do to combat overeating when you work from home?